I meant to post this a while ago, but I have a tattoo. Have since March. I didn't post right away because I wanted to surprise some people, but by now most people have seen it anyway (Bill's annual Las Vegas pool party and all). Definitely my life outlook is shaped by the ideas of statistical expectation and variance right? And yeah, I could have done a lot of different functions, but normal curves are pretty. Anyway, several months later, I'm pretty happy with it. I've received a lot of compliments on it, even from people who don't get what it is. Actually, those people are typically even more curious about it because they've never seen a tattoo anything remotely like that. 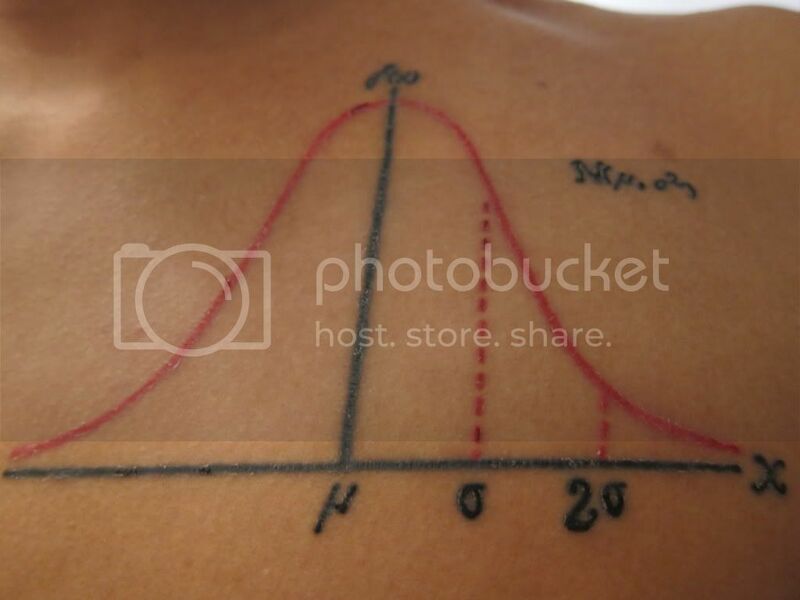 And the target demographic (math geeks and those who hang around math geeks) loves it, too: Jerrod interrupted a phone conversation with Michelle by saying, "...aaaand Terrence has a normal curve tattooed on his chest." "Why? Because he's awesome." But I think the best description (and compliment!) came from Hoss, who said, "that has to be the nerdiest meatheadiest thing I have ever seen." Yeah, that's about right. I'm definitely a little meatheady and nerdy, so this seems like the perfect thing to have on my body. Well managed on all fronts, and on all fonts. Well played. Error running style: S2TIMEOUT: Timeout: 4, URL: terrencechan.livejournal.com/347214.html at /home/lj/src/s2/S2.pm line 531.